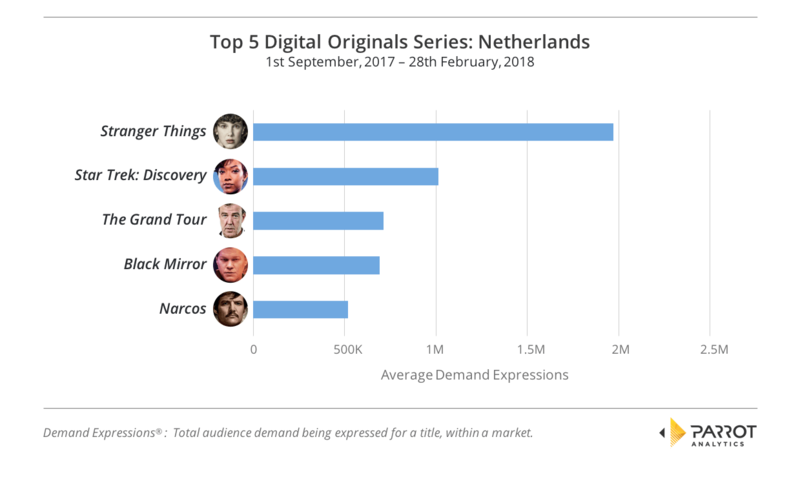 As TV audiences in the Netherlands settle in for Quarter 2 viewing with the major streaming giants vying with traditional content providers for gains in market share, Parrot Analytics has compiled a detailed snapshot of how the dominant shows, genres and sub genres have performed for the period spanning September 1st, 2017 – February 28th, 2018. We have examined both linear and SVOD-first shows in our analysis. With an emphasis on capturing TV consumption and engagement from fans within a specified market, Parrot Analytics’ comprehensive TV demand measurement platform provides unprecedented insights into global, cross-platform, country-specific audience demand for television content. In this analysis we have turned our attention to one of Europe’s hottest TV markets – The Netherlands. 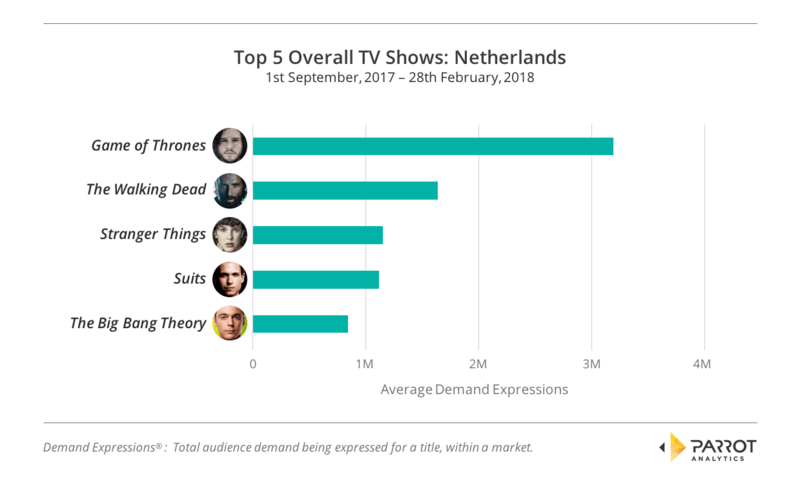 HBO’s Game of Thrones leads the pack when it comes to the most in-demand overall TV show amongst Netherlands viewers. Garnering up an imposing 3,644,760 average daily Demand Expressions the gripping fantasy drama has showed no signs of slowing down in its reign as the world’s most popular TV show. 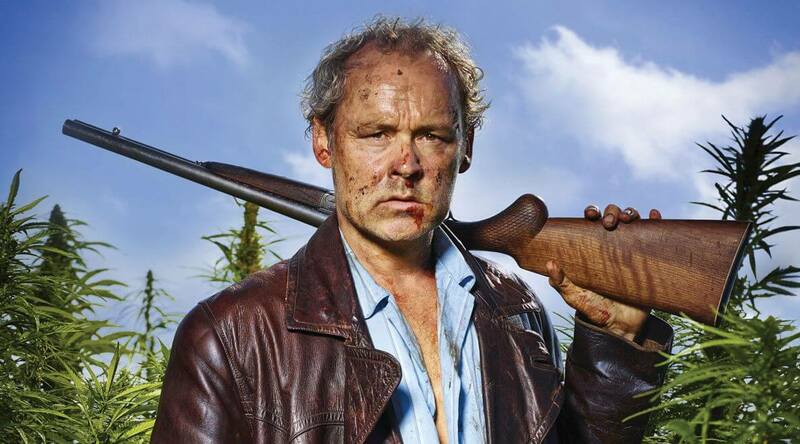 AMC’s apocalyptic Zombie epic, The Walking Dead demonstrated that it still has massive appeal amongst Dutch viewers by generating the second highest demand overall for a TV show. Now ending its 8th season it remains to be seen if the show will hold traction and maintain dominance as it moves into its 9th season, which is expected to air in autumn, however no definite air date has been announced yet. Stranger Things’ winning cocktail of savvy supernatural story progression laced with 80’s nostalgia also clearly resonated with Dutch viewers, edging out the global super-hit legal drama series Suits with just under 2 million average daily Demand Expressions. Comedy mega-hit The Big Bang Theory found a respectable foothold on the precipice of most popular overall TV show by also breaking through the 1 million average daily Demand Expressions mark to close out the 6 month period in 5th position. Netflix’s Stranger Things beat out all other rivals in the digital originals category by garnering almost 1 million more average daily Demand Expressions than the 2nd most popular digital original – CBS All Access’ Star Trek: Discovery. Both series were the only two titles to rise above the 1 million daily Demand Expressions ceiling. Amazon Video’s widely acclaimed and highly anticipated motoring show – The Grand Tour – performed admirably amongst TV viewers in the Netherlands where the allegiance to the original Top Gear cast was made clear in the 715,581 daily Demand Expressions that landed this digital original in 3rd place. The gripping yet profoundly disturbing dystopian sci-fi drama Black Mirror, also from Netflix, did not go unnoticed amongst TV audiences in the Netherlands. The show, now having completed its 4th season, ranked as the fourth most popular digital original followed closely by the latest season of Narcos, which saw Agent Pena pitted against the formidable Cali cartel. 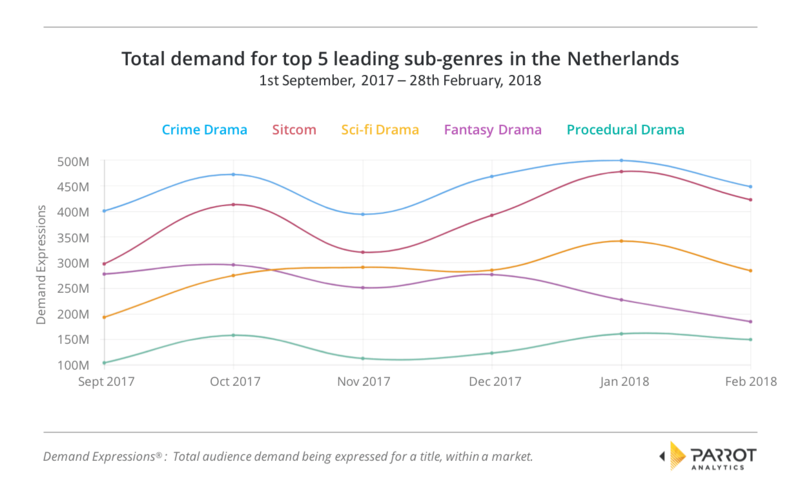 The Blacklist, Hollands Hope and Narcos all drove the demand trend for crime drama higher than all other sub genres on television. Both crime drama and sitcom tracked similar trajectories throughout the 6-month period with crime drama remaining dominant throughout. The Big Bang Theory, Modern Family and Mr. Bean fueled the sitcom demand trend, keeping it ahead of science-fiction drama, fantasy drama and procedural drama. The most notable tussle amongst the sub genres in the top 5 was between sci-fi drama and fantasy drama. Sci-fi drama began the 6-month window at the 200 million total daily Demand Expressions mark, noticeably below fantasy drama which started out in September 2017 at just under the 300 million. Propelled by Game of Thrones, Once Upon A Time and The Vampire Diaries the fantasy drama sub-genre trended up from September to October, dropped down in November, enjoyed a surge in December and then followed a steady decline in demand from thereon out. Conversely, the top performing shows in the sci-fi drama sub-genre – Stranger Things, Star Trek: Discovery and Black Mirror – drove demand on a fairly consistent upward trajectory to close out the 6-month bracket a full 150 million Demand Expressions ahead of where it started back in September, 2017. The demand trend for the procedural drama sub-genre – whose top 3 shows were NCIS, Lucifer and Criminal Minds – paralleled the rise and fall trends of the two leading sub genres yet remained well below the 200 million mark throughout the entire 6 month period. The average demand for drama titles is highest in the Netherlands amongst Northern European neighbors. 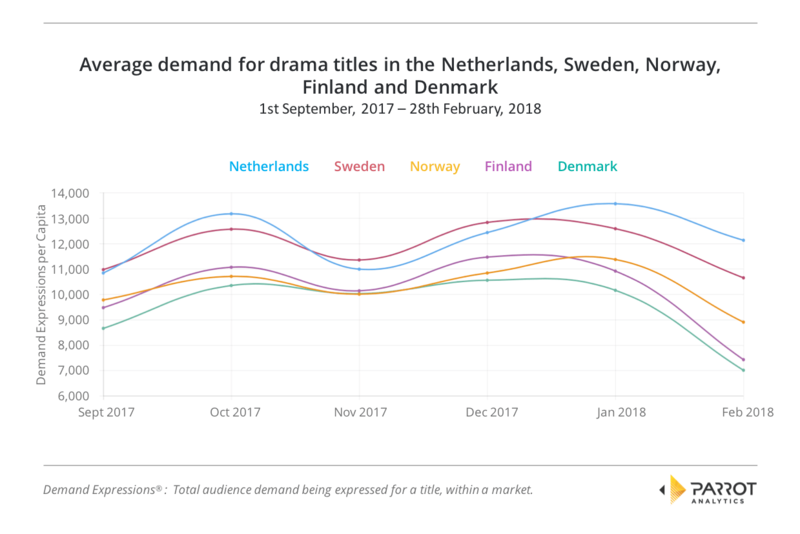 When we chart the demand over the 6-month bracket from September 2017 to the end of February 2018, both The Netherlands and Sweden trended highest in demand for drama titles. Of particular interest is that the demand pattern of all 5 countries charted – Netherlands, Sweden, Denmark, Norway and Finland – followed the same surge and fall pattern over the period. First, demand within each country for drama titles rises from September to October and then drops off again to November. November to December then sees the demand trend within each country rising slightly before either peaking in January, or beginning to drop again. From January to February demand within each country (with the exceptions of Netherlands and Sweden) drops below the starting point 6 months earlier. Will drama continue to dominate in the second quarter? 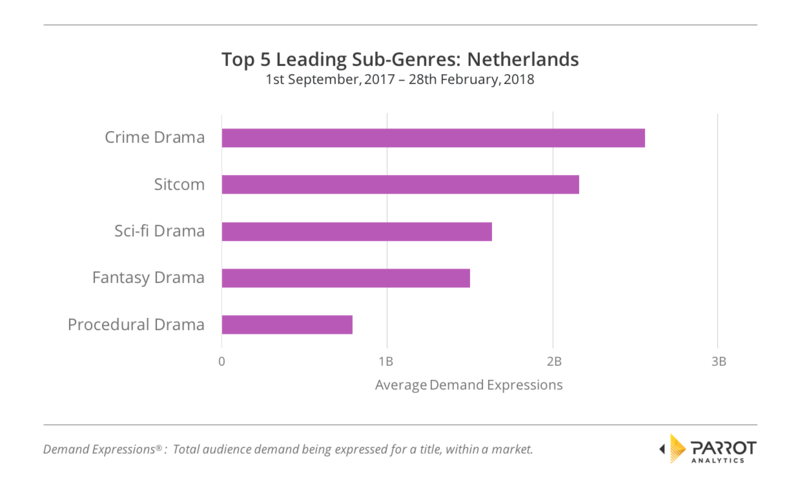 Drama and its subsets are clearly fan favorites in the Netherlands and it remains to be seen if the demand for drama continues to dominate. TV aficionados certainly have a lot to look forward to, as the major SVOD networks continue to invest heavily in acquiring the very best shows as well as producing their own digital originals, including local co-productions. As always, Parrot Analytics will continue to research, collate and publish relevant data-driven TV insights for leading international markets to ensure our audience and clients always have their finger on the pulse both globally and across specific regions of interest.